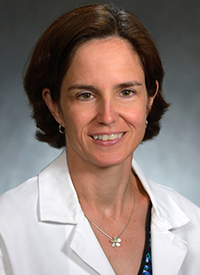 The combination of olaparib (Lynparza) and durvalumab (Imfinzi) demonstrated encouraging activity in patients with HER2-negative metastatic breast cancer with germline BRCA mutations, prompting an expansion cohort within the open-label phase II MEDIOLA trial, explained lead study investigator Susan Domchek, MD. Following a 4-week run in, in which patients received 300 mg of olaparib monotherapy twice daily, patients continued on olaparib at the prespecified dose and were given 1.5 g of intravenous durvalumab every 4 weeks. At 12 weeks, findings from the interim analysis revealed a disease control rate (DCR) of 80% (24 of 30 patients; 90% CI, 64%-91%) among the entire study population, surpassing the prespecified target of 75%. At 28 weeks, investigators noted a 50% (90% CI, 34%-66%) DCR, a 63% (95% CI, 44%-80%) overall response rate, and a 9.2-month (5.5-13.1) median duration of response (DOR).1 Moreover, the median progression-free survival (PFS) was 8.2 months at this time. The median DOR seemed to favor the combination over the median 6.4 months that had been observed with olaparib monotherapy in the OlympiAD trial in patients with BRCA-mutant metastatic breast cancer, results of which led to the agent’s FDA approval in January 2018. In patients who received ≤1 prior lines of chemotherapy (n = 14), the median DOR with the combination improved to 12.9 months, whereas patients who received 2 prior lines of chemotherapy (n = 5) saw a median DOR of 5.5 months. In an interview with OncLive, Domchek, the Basser Professor in Oncology, executive director of the Basser Center for BRCA, and director of the MacDonald Women’s Cancer Risk Evaluation Program at the University of Pennsylvania, discussed the updated results of the MEDIOLA trial in patients with germline BRCA-mutated metastatic breast cancer and spoke to the next phase of development with the combination. OncLive: Can you provide an overview and rationale for the study? Domchek: MEDIOLA is a basket trial that has multiple arms. The arm of relevance for this meeting accrued patients with BRCA1/2–mutated metastatic breast cancer. The study was done to see whether the administration of olaparib in combination with durvalumab could improve either the response rate or the duration of response. What were the findings of the trial? This is an update of a prior analysis with longer follow-up. At 12 weeks, the DCR was 80% and the ORR was 63%. We also saw that there seems to be an improvement in the duration of response in individuals who received these drugs in the earlier-line [metastatic] setting. These data are consistent with findings from the IMpassion130 trial, which suggested that the earlier administration of a checkpoint inhibitor may make a difference. Are these findings consistent with expectations? Yes. We still don't know whether or not the duration of response is significantly better than olaparib alone. For that reason, there is going to be an expansion cohort with the combination for BRCA1/2 carriers. In that trial, there will also be other arms that are evaluating TNBC with HRD. We really don't know how much durvalumab adds to olaparib for BRCA1/2 mutation carriers, but there has been enough of a signal to expand the trial. Were there any unexpected toxicities? There doesn't seem to be any synergistic toxicity. What we’ve seen is what we would have expected for each of the agents alone. There are certainly the expected immune-related adverse events associated with durvalumab and the known toxicities with olaparib, the most common of which are nausea, fatigue, and anemia. What are the next steps for this research? The next step is to proceed with an expansion cohort. We were able to do a little bit of correlative work, in which there does seem to be some association with PD-L1 expression. This was based on a different assay than what was used in the IMpassion130 study. In our study, greater than 25% expression—either pretreatment or posttreatment—was associated with response. We still don't know which patients are best suited to receive a checkpoint inhibitor in addition to olaparib, but we know that the PFS with olaparib alone is not as long as we would like. Anything we can do to prolong disease progression would be great. Outside of the BRCA1/2-mutant arm, is there activity in other arms of the trial? The other parts of the basket were BRCA1/2-related ovarian cancer. The data [there] look quite compelling. That, too, is being taken into an expansion cohort. There’s also a triplet arm [within the breast cancer cohort] that’s evaluating the addition of bevacizumab to the combination. Furthermore, there was another arm that looked at small cell lung cancer, although that has not been as positive as some of the other work. Right now, BRCA1/2 patients have demonstrated the strongest signal. There are many trials underway evaluating PARP inhibitors in TNBC. It's going to be really important to define the appropriate subgroups. We don't really have good insight into that right now. Domchek SM, Postel-Vinay S, ImS-A, et al. An open-label, phase II basket study of olaparib and durvalumab (MEDIOLA): updated results in patients with germline BRCA-mutated (gBRCAm) metastatic breast cancer (MBC). In: Proceedings from the 2018 San Antonio Breast Cancer Symposium; December 4-8, 2018; San Antonio, TX. Abstract PD5-04. Domchek SM, Postel-Vinay S, ImS-A, et al. MEDIOLA: An open-label, phase I/II basket study of olaparib (PARP inhibitor) and durvalumab (anti-PD-L1 antibody)–additional breast cancer cohorts. In: Proceedings from the 2018 San Antonio Breast Cancer Symposium; December 4-8, 2018; San Antonio, TX. Abstract OT3-05-03.